Don’t get us wrong; we adore hummus and falafel as much as The Zohan, but there’s more to one of our favorite legumes than just those delicious standards. Check out these top chickpea dishes we love – we think you’ll feel the same. Roasted in the oven with pimenton, cumin, coriander, curry, and Moroccan spices, chickpeas meet spinach, crushed tomatoes and cava-poached golden raisins in this aromatic stew that’s vegan and gluten-free. This tapas and small-plates restaurant also serves grilled octopus with crispy chickpeas. Make a reservation at Cafe Ba-Ba-Reeba. Greek Fries at Kapnos, Washington, D.C.
Kapnos executive chef/partner George Pagonis created these Greek fries while experimenting with garnishes for another dish and making fried chickpea cakes. “We kept eating them and eating them until finally deciding to let the cakes stand on their own as a mezze,” he says. “The fries are cooked similarly to polenta, using chickpea flour, stock, and garlic. We prepare the batter and let it cool overnight, then punch out the cakes, fry them, top them with a tricolor peppercorn blend (pink, green, and black peppercorns) and Mizithra cheese and serve them over a Greek yogurt sauce.” Make a reservation at Kapnos. 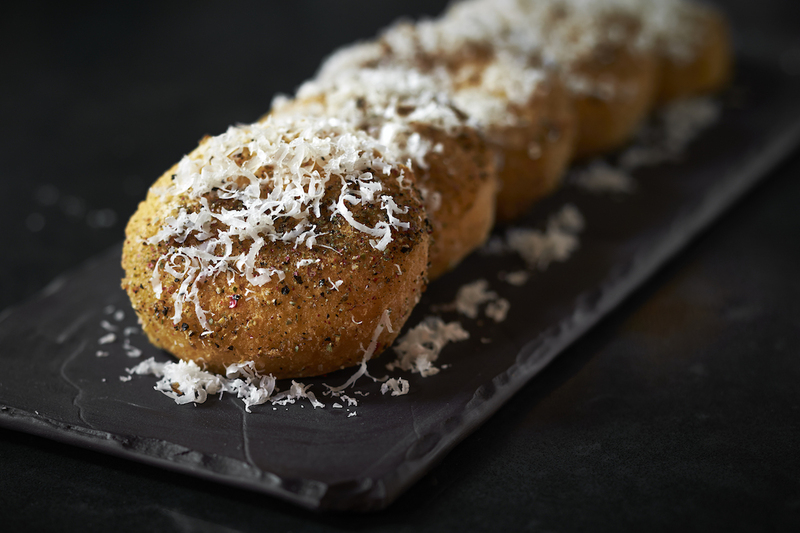 Hailing from northern Italy, executive chef Angelo Auriana and restaurateur Matteo Ferdinandi both remember exploring the streets of Liguria in search of farinata, a popular street food made of chickpea flour, water, olive oil, and salt. Often following the scent to an unmarked stall, they would eat the warm, crispy-edged snack straight from the oven. 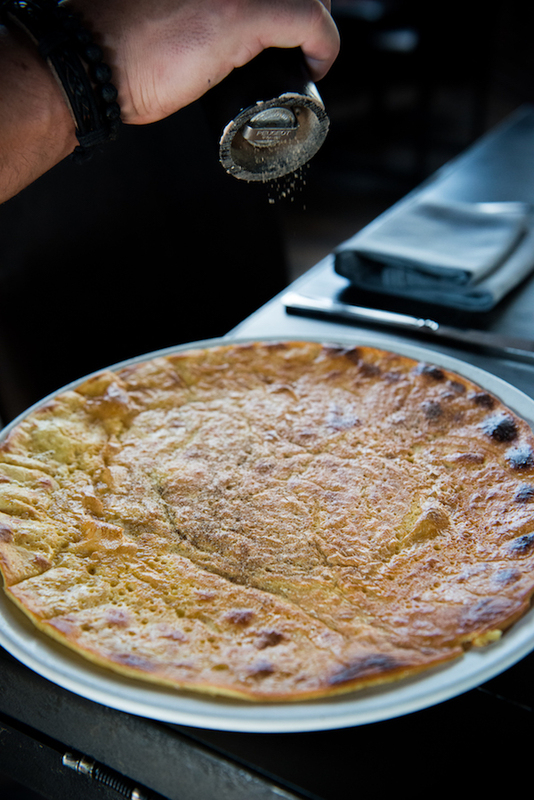 Officine BRERA replicates their quest to find farinata by offering the dish as an off-the-menu item for guests who know to order it. Make a reservation at Officine BRERA. 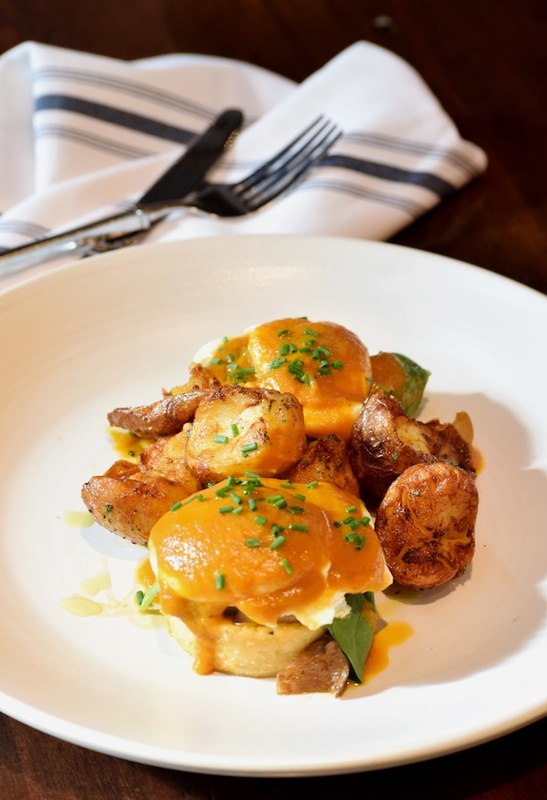 Chef Dolan Lane puts a new twist on the classic Eggs Benedict with chickpea cakes in place of the English muffin. The round cakes are crisped on the griddle, topped with spinach, mushrooms, and poached eggs, and – instead of hollandaise – roasted vegetable sauce for a rich, hearty flavor that’s lighter than a traditional Benny. Make a reservation at Red Star. 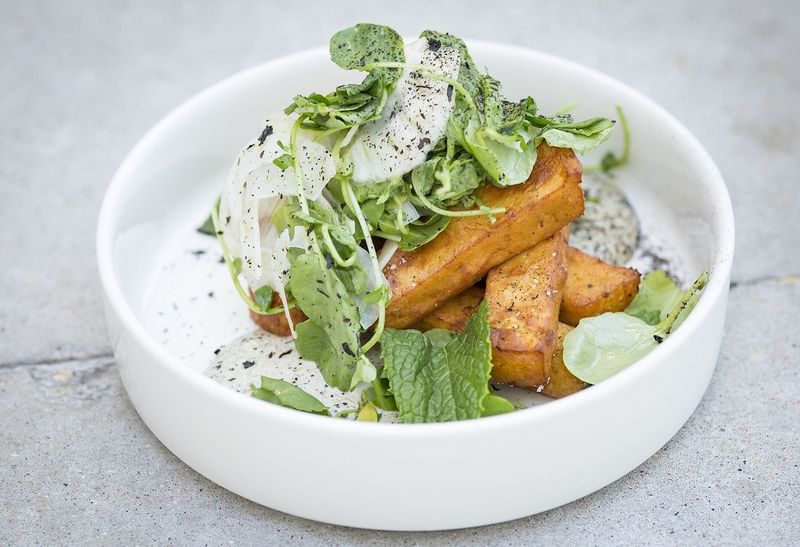 ROOF serves its Chickpea Panisse (a fancy way of saying chickpea fritters) with fennel sesame salad, knob onion aioli, and black lime. It’s a delightful combination of smooth and crunchy, tangy and creamy. Make a reservation at ROOF. 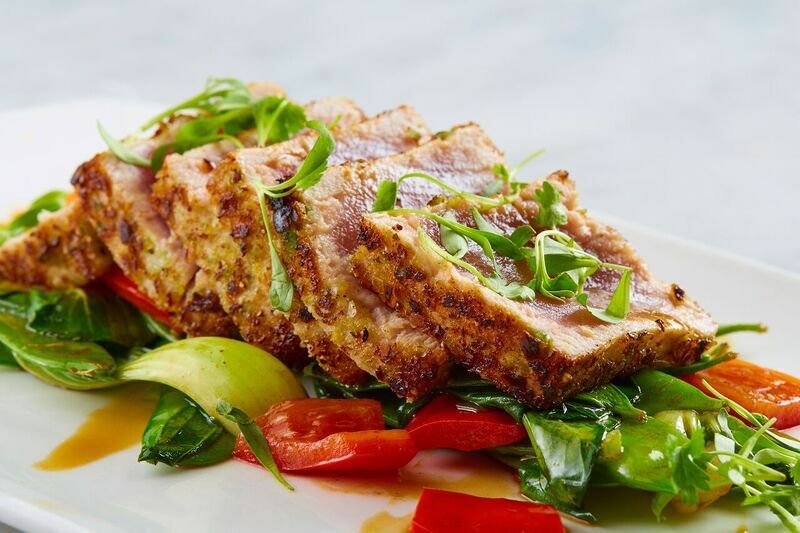 Chickpeas add crunch and flavor to this wasabi tuna, which is prepared with snow peas, red bell peppers, baby bok choy, and a sesame-soy glaze. Fun fact about Dakota’s Steakhouse: According to its website, the restaurant is located underground because the site was once occupied by the First Dallas Baptist Church, and the deed prohibiting future owners from selling alcohol on former church grounds. However, the property company found a loophole by situating their restaurant below ground. Make a reservation at Dakota’s Steakhouse. Located in Midtown East, this British pub calls to mind a fourteenth-century tavern — but with modern twists. 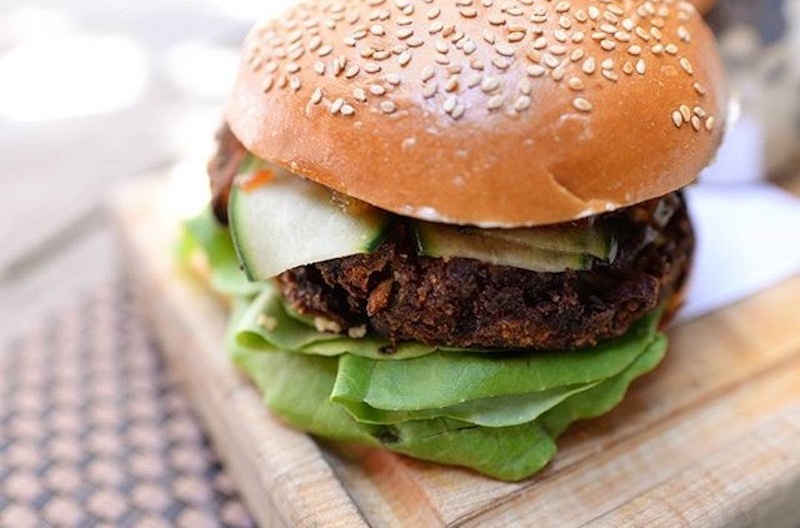 The veggie burger is made up of a spicy chickpea patty, tomato chutney, garlic mayo, and pickled cucumber for a sophisticated take on pub grub. Make a reservation at The Shakespeare. 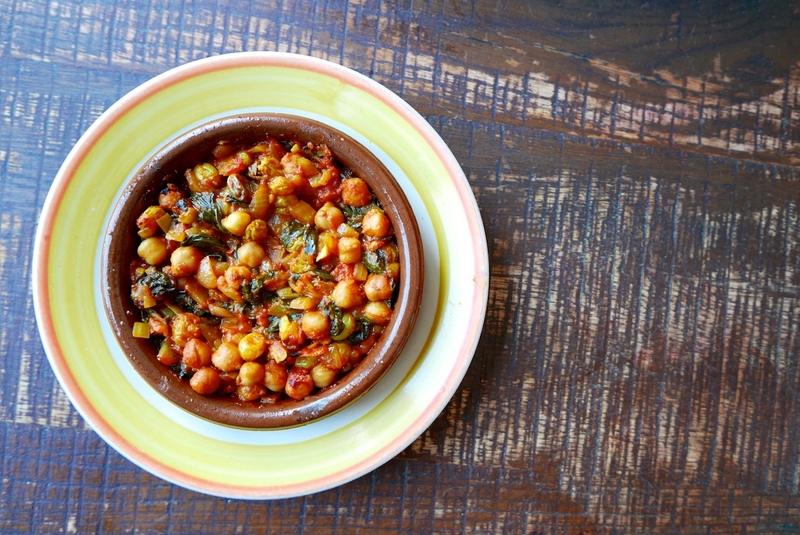 Have you tried any unusual chickpea dishes? Share what you’ve been tasting here or over on Facebook, G+, Instagram, Pinterest, or Twitter. And, remember to snap + share your #dishpics with us on Instagram for a chance to win in our weekly giveaway. Photo credits: Jesus Banuelos (Officine Brera); Greg Powers (Kapnos).